The Wild has lost three in a row, and five of seven, and heads on a three-game Western Canada swing with games Tuesday in Vancouver, Thursday in Calgary and Friday in Edmonton. The streak has dropped the Wild to fifth place in the Central Division and eighth in the Western Conference. "Two weeks ago we were third in the league overall, and now we're 14th," coach Bruce Boudreau said after Monday's practice at Tria. "That's why you build up [early] equity, you're still in the mix. If you started out 2-8 and then you went through this one, you'd be in trouble, like some people are. We've got to turn it around and in the next 10-game segment do really well." Goalie Devan Dubnyk has given up four goals in each of his past four starts, but Boudreau is intent on shoring up team defense. "We just went through the numbers for the previous nine games and the biggest difference is not shots, not goals for, it's not shots against -- it's goals-against. We're averaging a goal and a half more [against] in the last nine games, 3.55 I think. So when you have to score four goals a night to win games, you're not going to win a lot of games." 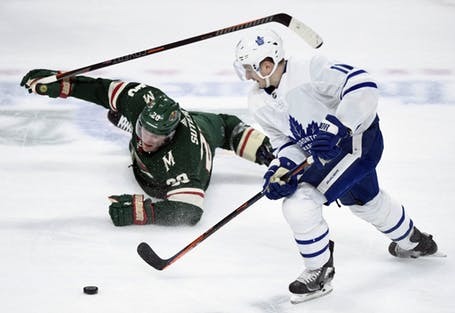 The Wild was happier with its effort in Saturday's 5-3 loss to Toronto, but the Leafs scored a pair of goals that bounced off Wild defenseman Nick Seeler. "We can say, 'Hey they got two fluky goals off Seeler' the last game, but there was three major mistakes in our zone before each one of those goals, so those are the things you have to shore up, and that play doesn't happen at all," Boudreau said. What did the coach say to Seeler? "Pat him on the back and say, 'Listen, next time we'll get them.' He does a lot of good things out there. It could have happened to Bobby Orr. Don't dwell on it or it will escalate."